At the risk of offending any pottery purists out there reading this, I’d like to say, I am grateful for the power tools in my life to make things like drilling holes so much easier. Each berry bowl I make has about 70 holes in it and that would take a really long time using a hand tool. With the drill it takes nearly no time at all and each hole is a consistent size. Using a jiffy mixer in the drill also helps me thoroughly mix large buckets of glaze, slip and plaster. One of my other favorite power tools in the studio is my Dremel with a Lithium Ion battery. With a diamond bit, it is invaluable in removing bits of kiln wash that stuck to the bottom of pots and smoothing any rough edges that could be sharp after glazing. As I age, I’ve come to appreciate making simple things easier so I can put my energy into the things that aren’t so simple. 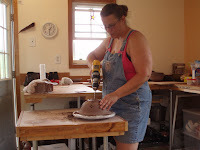 Power tools, an electric wheel, an electric kiln and an Ipod are all tools that help me create. Thank you to the inventors of each! !